If you spend a lot of time hunting for and photographing wild orchids, you cannot fail to notice broomrapes: in many cases they share the same habitats as orchids, and at first glance their appearance is very similar indeed to some orchid species. Whilst many orchid flowers can be described as being pretty, this is not an epithet that can easily be applied to broomrapes, but they do have a strange beauty all of their own and are certainly as varied and colourful as orchids and equally as fascinating. The other factor common to the study of broomrapes and orchids is the difficulty in accurately identifying them, and so taking a close interest in broomrapes is very likely to be every bit as vexatious and frustrating as, for instance, taking on the mission of total clarification of the Ophrys fusca group of orchids! What are Broomrapes and how do they Grow? 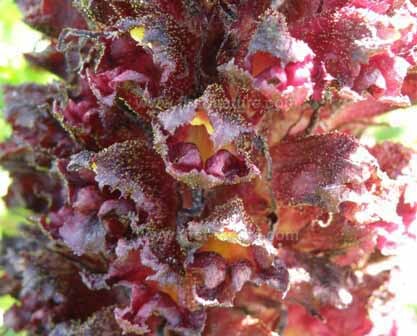 Broomrapes belong to the Orobanchaceae family, which contains sixteen genera with around 200 species worldwide. These plants, which can be either annuals or perennials, are without chlorophyll; they are parasitic on the roots of other plants, from which they obtain the nutrients they require to germinate, grow and bloom. Broomrape seeds will not germinate until they come into contact with the roots of their host plant, at which point the broomrape seed attaches itself to its host by means of a tiny root that penetrates the host’s root until it reaches the vascular system of the host. Soon afterwards a tuber forms, directly linking the broomrape to the host’s supply of nutrients. Once flowering is over, the broomrape no longer requires food from the host and so the connection between the two comes to an end. 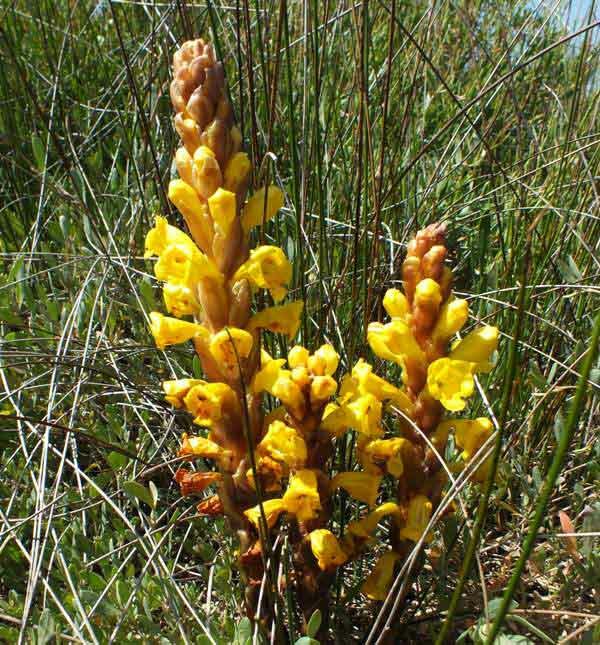 If tissue from the broomrape remains inside the root of the host plant it is possible for the parasite to grow and bloom again in following seasons. Some broomrapes only parasitize one particular host species, whilst others are far less fussy about their hosts and will form relationships with a variety of plants. 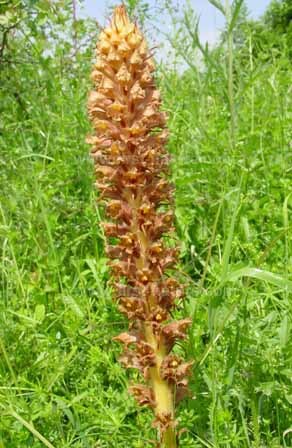 Because broomrapes appear several metres away from their hosts, it is inadvisable to assume that the closest or most numerous plant species in the broomrape’s vicinity are the hosts, particularly if the broomrapes in question are of a type that use more than one species of plant as hosts. Below: Orobanche elatior - Knapweed Broomrape - a tall, robust species that occurs throughout much of Europe except theMediterranean region, where it is rare. Some broomrapes have very few flowers but others have 20 or more, and most species are pollinated by insects that are attracted to the scent of the flowers (which may or may not be pleasant to our noses) and are then rewarded with nectar before they move on to other plants in the vicinity. Once pollinated, the broomrape flowers produce seeds that can number in the thousands. These tiny, lightweight seeds are carried away on the wind. During rain they are readily absorbed into the soil, where they may make contact with the roots of suitable host plants. Although broomrapes are widely distributed in the warm or temperate regions of the world, nearly all of the species that occur in Europe are threatened or even in danger of becoming extinct due either to habitat loss as a result of the construction of buildings or roads or to habitat degradation caused by intensive agriculture using large amounts of herbicides and pesticides. On the other hand broomrapes can cause serious damage to crops, particularly in the Mediterranean region where broomrapes occur in such vast numbers that entire crops are sometimes wiped out. Because broomrapes penetrate the roots of the host plants, it is virtually impossible to eradicate them by weeding or hoeing between crop rows. Broomrapes are also eaten by cattle; then, when manure from the animals is spread on the land, the parasites can be introduced into fields that were previously free of infestation. Remedies include deep ploughing, which drives the seed too deep down to penetrate the roots of the plants being protected; later cultivation of crops, thus allowing the broomrapes less time to develop; and the use of fungi to destroy the broomrapes before they develop sufficiently to damage their hosts.